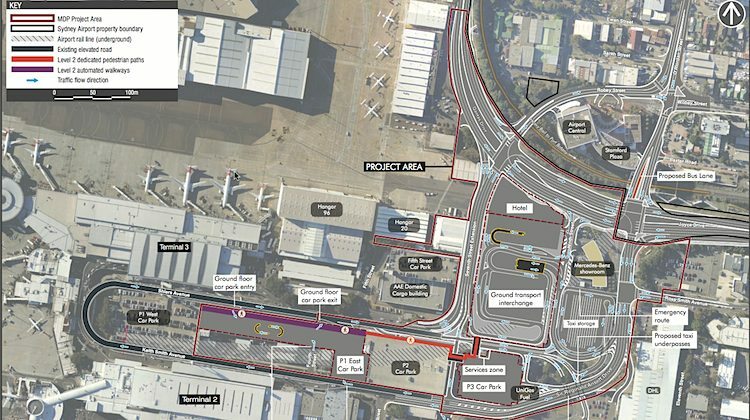 Construction work on road changes as part of Sydney Airport’s new ground transport infrastructure at its two domestic terminals has begun. The project, which received Federal Government approval in March 2015, includes a multi-level ground transport interchange for Terminal 2 and Terminal 3 – which handle domestic flights – creating more space for public buses, coaches and cars. Some roads are being widened and others converted to one-way only in an effort to improve traffic flows for vehicles. There will also be more space created for pedestrians and cyclists as part of the development, as well as an increased number of car parking spaces. The work will take three years to complete and complement the NSW Government’s efforts to improve the existing road infrastructure around the Sydney Airport precinct and add extra bus and train services. Sydney Airport chief executive Kerrie Mather said stage one of the project, which commenced on Tuesday, was the creation of a new dedicated five-lane one-way exit road out of the domestic terminals precinct. “It’s our priority to make it easier for passengers, visitors and staff to travel to and from Sydney Airport by car, taxi or public transport,” Mather said in a statement on Tuesday. “We’re commencing ground access improvement works in the T2/T3 terminal precinct, which when completed will create a better performing one-way road network that significantly improves traffic flows and minimises delays by providing motorists with more ‘green light time’. NSW Minister for Roads, Maritime and Freight Duncan Gay said the state government was doing its part to ease congestion on roads that lead to Sydney Airport’s domestic and international terminals. “We are committed to continuing the travel time savings motorists will soon experience inside the airport precinct on the roads that feed to, from and around the airport,” Gay said. The project also included construction of a new four- to five-star hotel with about 430 rooms within the Sydney Airport’s domestic precinct.